It was a Sunday, it was raining. I remember what I was wearing. I only had black shoes. I remember what he was wearing, he wore a tie that his mother still had of his father's. It was only 9 days prior that the sun was setting when he popped the question and I said yes. So many things to do in 9 days. I wanted some type of wedding with a cake and flowers, a dress and people. We took vows to love, honor and cherish. For better, worse, richer, poorer, sickness, health and forsaking all others. To this day I can tell you almost every detail about that day 31 years ago. That very day, Hubby could have told you the main objective of the day, we were there, we got married. He could have recalled this same information, if asked, for many years. 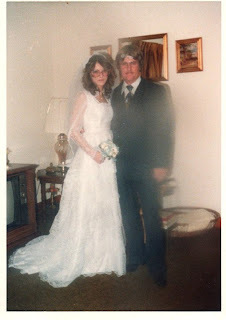 These days because of Lewy Body Dementia, Hubby doesn't even remember that we got married. He doesn't remember me as his wife. It's difficult to celebrate the day so I will just happily remember it. It was filled with hopes and dreams of what was and what would be. Promises of the day, for the day and for tomorrow. We may not have known it then, but God had big plans for us by putting us together. The dynamics appeared all wrong and we were given a 6 month expiration date by many. The journey has been long and hard, sometimes unbearable. Other times there was bliss and blessings of magnitude. I can name 3 right off the top of my head. That's the better or worse part. Today is our Anniversary Hubby. Thank you for making me want to be a better person for me, for you and for others. You continue to forge me daily. I hope you feel loved, cared for and safe. Happy Anniversary! God bless you and your husband. Happy Anniversary, Kathy and Hubby! Happy Anniversary from all of us! To both of you. (love the lower picture).